Kevin Zielinski is one of those guys who's far more well-known more among his peers than the general public. 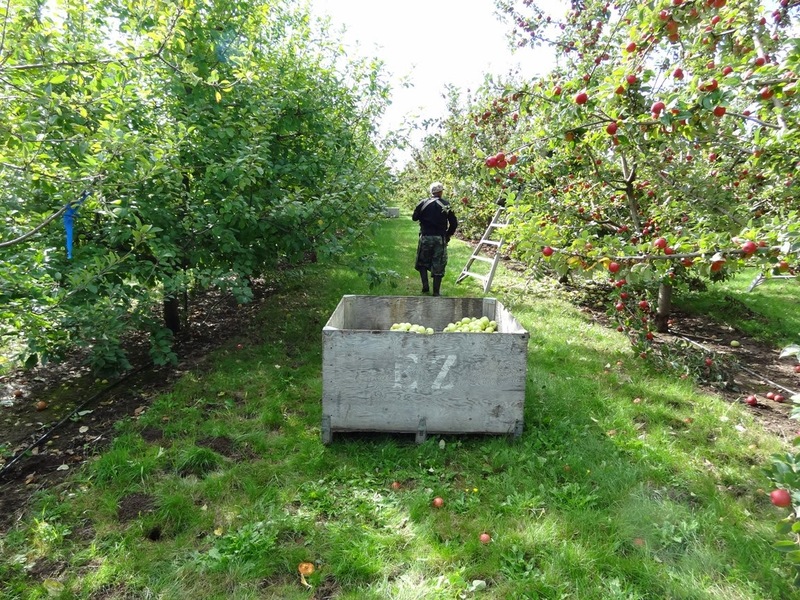 He is a third-generation orchardist on land located just north of Salem. His grandfather planted the farm, EZ Orchards, in 1929, and the family has been growing fresh produce ever since. Locals are far more likely to know the Zielinskis for Harvest Fest and the Farm Market than what must look like a side project to them. And yet within the cider community, Zielinski commands enormous respect for his coruscating, complex French-style ciders. Most Northwest cideries do not own their own orchards nor come from a growing background. In this way they differ from Oregon vintners, who commonly do grow their own grapes. I often talk to a cider-makers who are quick to say that they wouldn't know how to manage an orchard and are happy to have someone else do it properly. 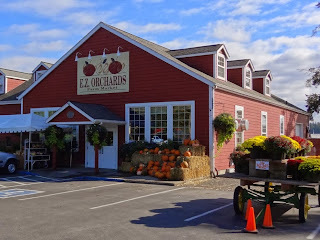 A couple weeks ago, I took a trip down to EZ so I could hear an orchardist cider-maker talk about the tree and fruit side of things. You will not be surprised to learn that I found it illuminating. 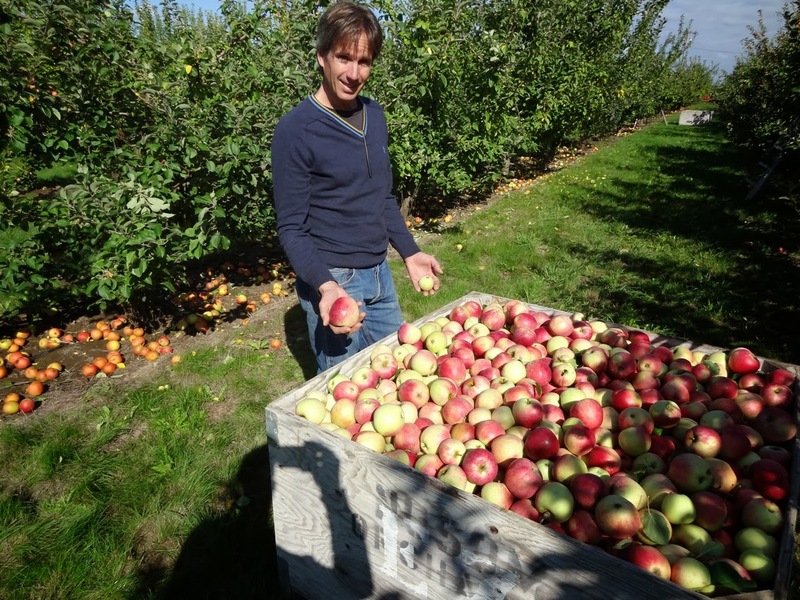 The Zielinskis used to grow exclusively eating apples, but in 2000 a winemaker approached Kevin with the idea of having him grow cider apples to make French-style cider. The vintner supplied the scion wood for grafting--twelve varieties of French cider apples. Wait, scion wood? Right, let's stop for a bit of botany. 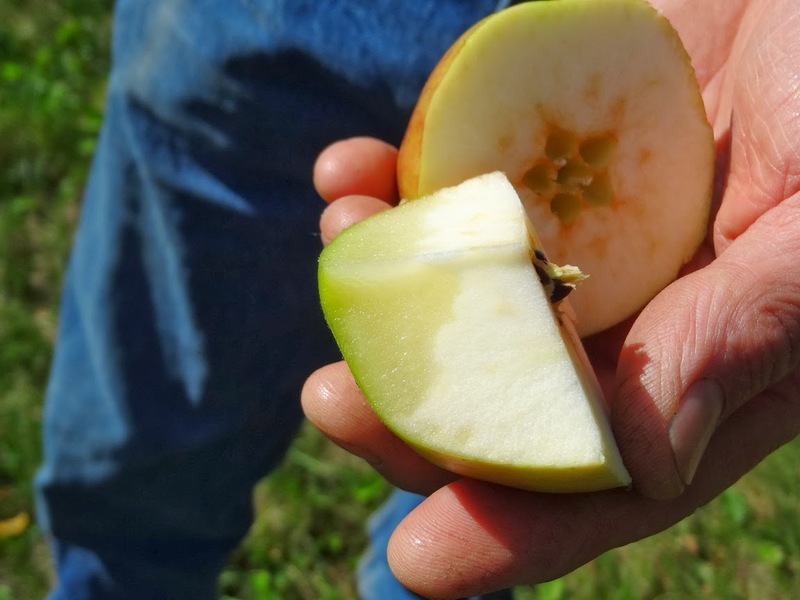 If you take the seed from that honey crisp you love and plant it, a tree will grow that produces entirely different apples--a quirk known as "heterozygosity" in genomics. 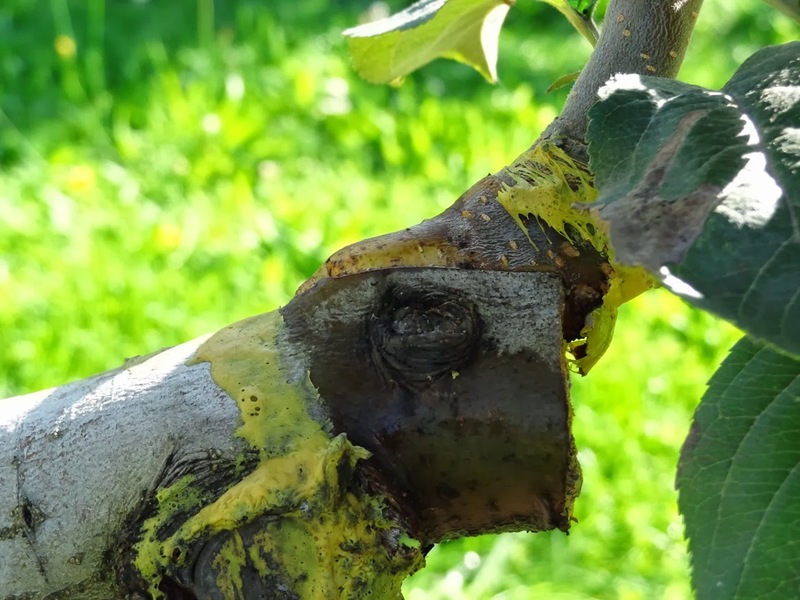 Instead, you have to graft the branch that grew your apple onto a new apple tree in order to get the honey crisp, That branch is called scion wood. Kevin was happy to oblige, and planted twelve varieties of apples, 300 trees in all, on an acre of his land. The vintner left in 2003 before the trees were producing much volume, but Kevin decided to go ahead and make cider himself. His first vintage came out in 2007, and he's been refining and expanding ever since. During my tour, our first stop was at a new field recently switched over to cider apples, using branches from other trees in the orchard. The trees are grafted in the spring and by fall have knitted together pretty well. What you see in the picture to the left is a bit of residue from the yellow tape that keeps out bacteria and fungus and keeps the sap flowing. The advantage of grafting is speed: a new tree will take seven years to produce, but a new graft will become productive in half the time. The initial acre of land has now grown to eleven. Kevin decided to stick with French apple varieties and he makes cider in the French method. We passed trees with names like (and I hope I'm spelling them correctly) Frequin Rouge, Domaine, and Pomme Fatille. I have a sense orchardists relate differently to their fruit than do many cider makers. As we approached each new variety, Kevin would light up and describe the qualities of the fruit and the growing behavior of the tree--as if they had individual personalities, like people. Even when a type of apple was more or less a failure, he'd call it a "curious" tree, as if it were just misbehaving. The cider he makes is distinctive in that it is made in a way that accentuates the fruit. The French method borrows from the philosophy of winemaking, which is also Kevin's approach. “My wine-making interest was in doing spontaneous ferments, a very fruit-sensitive, fruit-aware method of fermentation. So as I was looking at the way to make cider, I looked at a more traditional or ancestral method.” Describing the French method is something for a different post, but one of the key features is it involves using no additives at all, including yeast. What you taste in an EZ Orchard cider comes exclusively from the apple and its fermentation. Apple skins are coated with yeasts that spark fermentation on their own. EZ Orchards produces essentially one type of cider that comes from a blend of the ten different apple varieties. It takes months of fermentation and conditioning, and is bottled like sparkling french wine with natural carbonation. (Kevin did recently add his version of a mass-market cider called Hawk Haus that is made with the old dessert variety Jonathans and a touch of Yarlington Mill and crab apple--but it is otherwise produced in the same way as the regular cider.) Everything is natural. Coming from the place of an orchardist gives the Zielinskis a particular perspective. They are used to very long lag times. Plant an orchard and wait nearly a decade for it to become a commercial crop. They can look back over the decades of farm life and therefore see everything as a long game. Kevin is in no great hurry to get his cider from tree to bottle, so he can take a year to get out a new vintage. And when he grinds and presses his apples at a nearby winery and begins the slow process of fermentation and conditioning, he's happy to let the cider mature at its own pace. “If I’m making cider from fruit, let’s let the fruit be the factor that has the most influence.” He describes himself as an orchardist, not a cider-maker, but that's not exactly right. He is a cider maker, too--just one who wants to make sure drinkers are tasting every bit of the flavor and aroma he enjoys from the tree. of the fruit as it ripens and it’s getting laden with juice." Buy This Book: Pete Dunlop's "Portland Beer"